Carol-singing, hot chocolate, latkes and ice skating are all things that get us into the spirit of the holidays. But now there’s a new way to deck the halls: with code. Earlier this year, we introduced a program called Made with Code to inspire millions of girls to try coding, and help them understand the creative things they can do with computer science. Starting today on madewithcode.com, girls can use the introductory programming language Blockly to animate the lights of the state and territory trees that will decorate President’s Park, one of America’s 401 national parks and home to the White House, through the holiday season. The programmed lights will debut at the 92nd annual National Christmas Tree Lighting ceremony, which will be livestreamed by the White House on Thursday and air on PBS nationally throughout December in partnership with the National Park Foundation and National Park Service. The tradition of the tree lighting ceremony dates back to 1923 when President Calvin Coolidge lit the first fir tree outside the White House, and this is the first year kids from across the country will be in control of the state and territory holiday tree lights! As the mom of two girls, I know that technology is a pathway for their future success. Still, even as coding becomes more important, less than 1% of high school girls say they’re interested in pursuing computer sciences in college. But I'm also an engineer, so I’ve seen firsthand how exciting CS can be. I fell in love with code early—my dad was an engineer and he encouraged me to enter a programming competition in the seventh grade. I gave it a shot, and I’ve never looked back. Ever since that day, I’ve known that when I program something, I’m creating something totally new for the world. That’s what Made with Code is about: discovering that creating something new and exciting—whether it’s a holiday tree, a video game or a driverless car—can be accomplished with the power of code. But it’s also about building an ecosystem of support for girls through parents and teachers, and to show girls other women who are using CS to achieve their dreams. 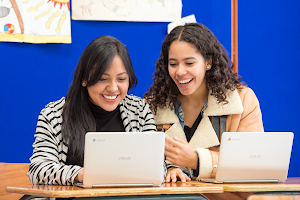 This challenge also kicks off Google’s commitment to CSEdWeek, a week dedicated to inspiring students to get interested in computer science that’s become one of the biggest education initiatives online. Over the coming week, thousands of Googlers will join the hour of code, and announce a few other special projects that we will fund through the holiday season and coming year. 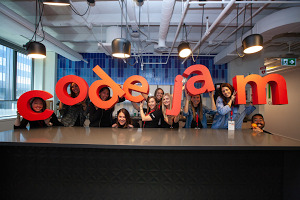 I’m heading to Washington, D.C. this week to be a part of the ceremony, and I’m looking forward to watching the designs from girls across the country lighting up the nation’s capital—and inspiring my daughters and so many others with the power of code.